2.56 billion of those downloads were - surprise - Angry Birds and other games. 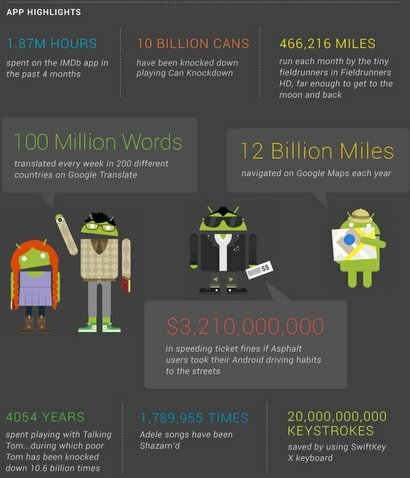 Google's Android operating system has tried to compete with Apple's iOS the past few years. Apple's sleek iPhones and iPads are clearly the tech-world's darlings, but so many different manufacturers buying into Google's open system has led people to declare "Android is ahead of the iPhone now!" - if by people you mean Google executive chairman Eric Schmidt. Corporate enthusiasm notwithstanding, the Android Market has delivered up a disturbingly large number of apps since it debuted in 2008. Google announced this week that it has surpassed the 10 billion app download mark, and that number continues to grow at a pace of one billion per month. 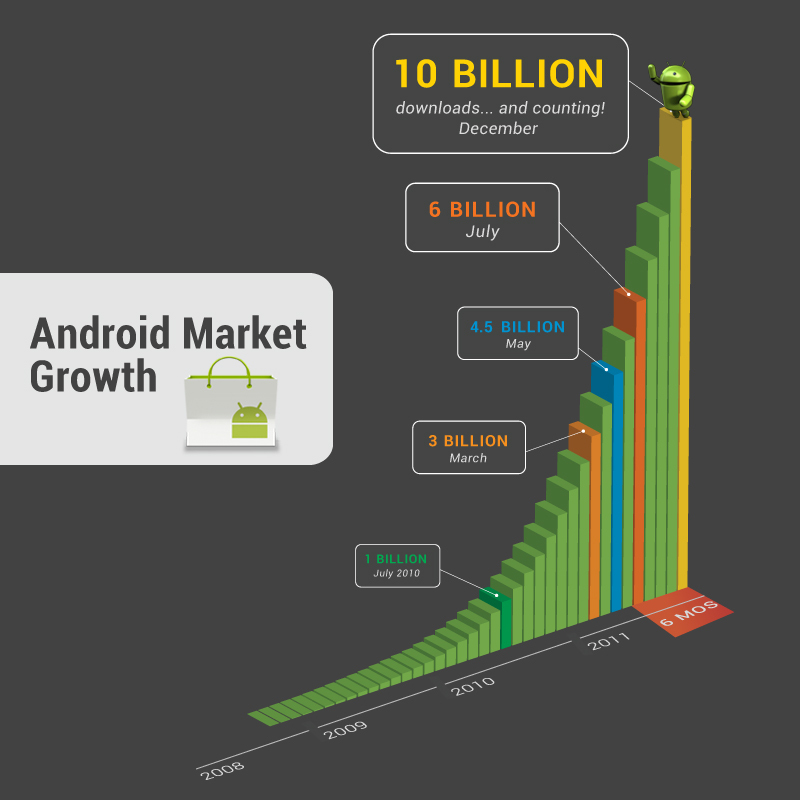 Google also released a few infographics to illustrate the Android Market's exponential growth and general usage stats. 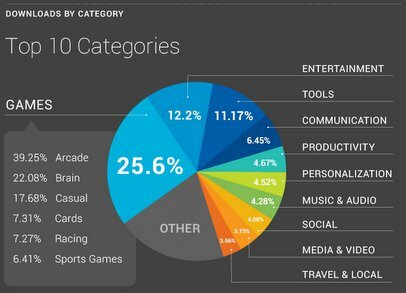 First off, the most downloaded category is clearly games - 25.6 percent - with entertainment and tools close behind (12.2 percent and 11.17 percent, respectively). When do most people by apps? Sunday at 9pm, the night before that big presentation on Monday. When were the least amount of apps downloaded? Monday morning at 4am when most sane people are either sleeping or drinking massive amounts of tequila to numb the anticipation of the coming work week. 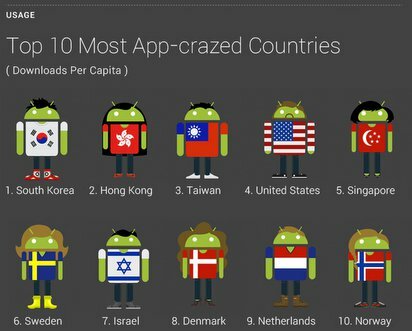 The final piece of strange stats is that the Asian countries of South Korea, Hong Kong and Taiwan were the most active on the Android Market per capita than the U.S. Maybe they know something we don't? Apple hit the same mark of 1 billion downloads just 11 months ago, but the App Store came out a mere 5 months before Google Android Market. So while it's clear that the App Store does more volume, Google is excited to see its downloads catching up. Developers might still prefer the App Store, but it's getting harder to say that Apple will have market share forever. Did I mention that I don't like Apple and I'm actively rooting for Google to succeed in the mobile marketplace? Well, I am.